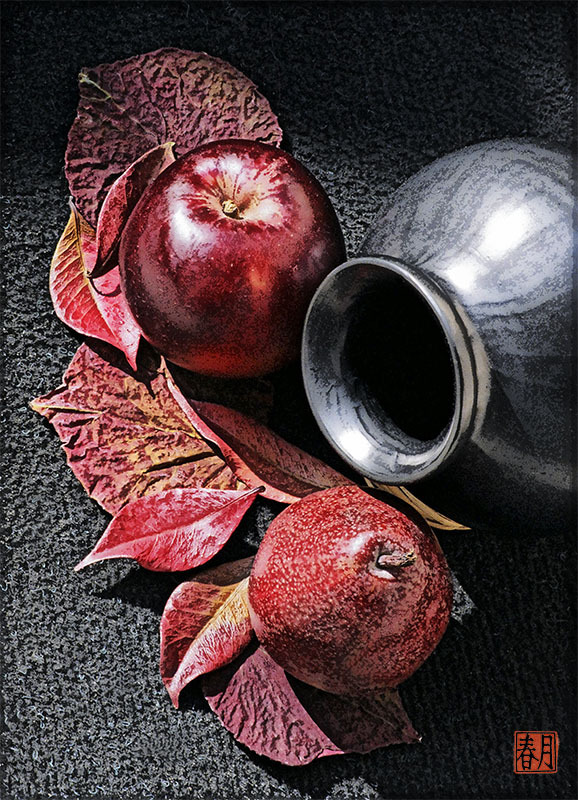 D’Gravure™ is a proprietary term for the textural, digital photo etchings Cynthe creates for art collectors. Our archival quality, ready-for-framing, art prints are not run on commercial presses or mass produced. Your selected image(s) are personally printed by the artist to her demanding specifications. Southern California sees autumn & winter color, too. Was visiting my older son & daughter-in-law in Santa Barbara, January 2006. 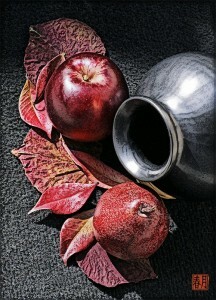 Glorious reds are featured in this apple pear art print of a ‘fertility’ still life grouping using a round black clay vessel, beautiful red fruit we had purchased at the farmers market, and pretty red leaves from the trees and shrubs on the property. Production Notes: Archival, velvety matte paper with pigment inks (rated to last 100+ years). All prints have white borders for handling & framing use. *MINI & SMALL sizes would make wonderful display groupings for images related by color, subject, or season. NOTE: LG sizes 12 x 16 up to 12 x 18 inches will require custom S/H quotes. thank you!!!! we got it on friday and i love, love, love everything. a friend was over on friday, and i got to show off your print to her. it is even more beautiful than i thought it was going to be.